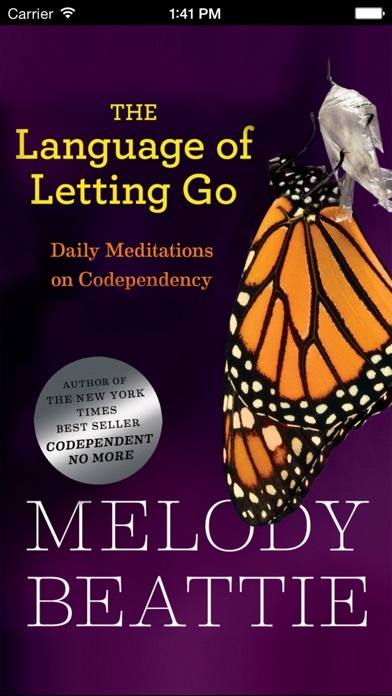 Find inspiration anywhere, at any time, with Hazelden Publishing’s Language of Letting Go app featuring all 366 daily meditations from the best-selling meditation book by popular self-help author Melody Beattie. 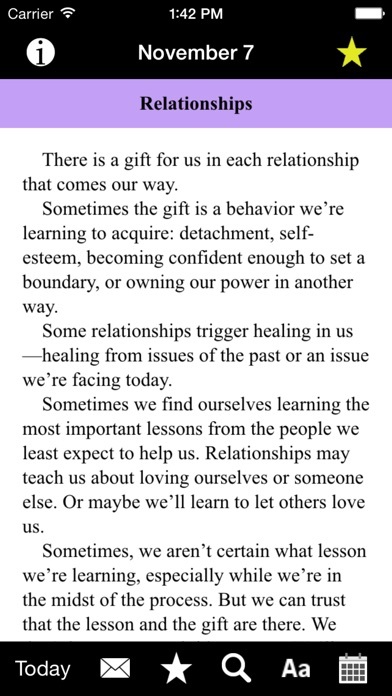 These daily messages help those who struggle with the issue of codependency find inner peace and the strength to take care of themselves. What Users Are Saying: “I read from this app daily and it is always helpful. 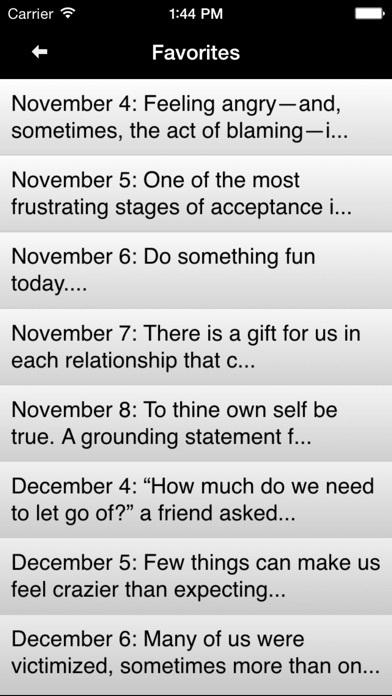 I am so thankful for these daily readings.” “A perfect way to start and end my day. And it goes with me wherever I go!” “Excellent App! I have my daily affirmation at my fingertips no matter where I am. I would definitely recommend this app! I love that the reading for today shows up without having to search for it.” “I’ve found these to be very useful. The right amount of message to begin my day with or peek at during the day when I need to get out of my own thought patterns. 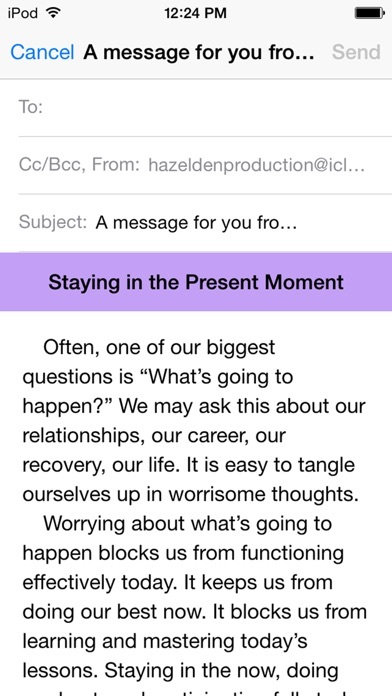 Very easy and helpful.” Features: PRESS the “Today” button to access today’s message. SWIPE forward or back to easily access more daily messages. SHARE the daily messages with friends through an automated sync to your e-mail or text. BOOKMARK your favorite meditations (press the star in upper right-hand corner) and easily return to them (press the star in the bottom toolbar). SEARCH all 366 daily messages by keyword. RECEIVE a notification every day to remind you to read the daily message. JUMP to a specific meditation using the calendar button. SHAKE your device to bring up a random message of inspiration and support. CUSTOMIZE the size of the font presented for reading ease. Codependency—the concept of losing oneself in the name of helping another—has rung true for millions around the globe, whether they have an ill parent, alcoholic spouse, or a sick child. By integrating her own life experiences and fundamental recovery reflections, Melody Beattie helps readers take responsibility for their own pain and self-care as she encourages them to remember that each day is an opportunity for growth and renewal. 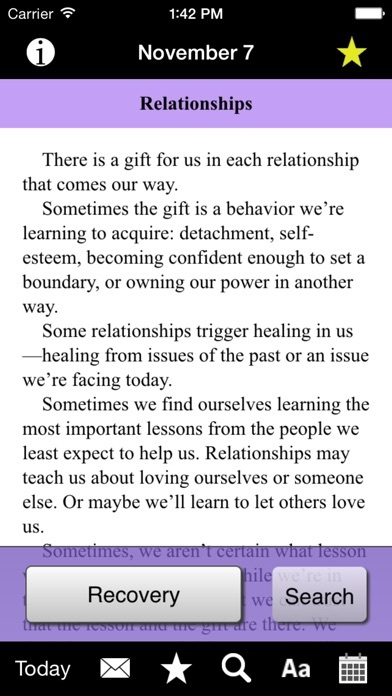 Always has some helpful thought for the day and keeps me on track with my codependency. I love having the daily inspiration pop up on my phone screen, I don’t remember to look at the book daily but with the app the thought for the day pops up at the perfect time. Helps me refocus and stay on track! Mentions real human issues or mental struggles we all may have , and provides a gentle meditation of acceptance that will lead you to overcome mental obstacles. Beattie has lived co-depndency, has written THE books on co-dependency, and has THE app! Love it. I absolutely love this app. I read it every morning to start my day. It seems to always give me some new insight or reminder that is exactly what I need at that moment . It’s uncanny. I recommend it often to friends and acquaintances. It is so practical and useable. My day would not be complete without my morning teading. This is similar to courage to change. It’s nice to have it on my phone when I travel. Melody Beattie has been a part of my recovery for years. I have all of her books, and now this app for 3+ yrs. I like that search feature and that I have the option to read my devotional anywhere, and also that I can share it via text or email with my friends! Awesome app - thank you for ALL of the great features!! Blessings!